The tallest land animal, the giraffe, has very long, muscular legs that reach roughly six feet tall and its front legs are approximately 10% longer than its hind legs. To lie down or to get up, the giraffe kneels on its forelegs. In order to drink water (typically every three days during the dry season), the giraffe must spread its elongated forelegs apart so that it can bend down. 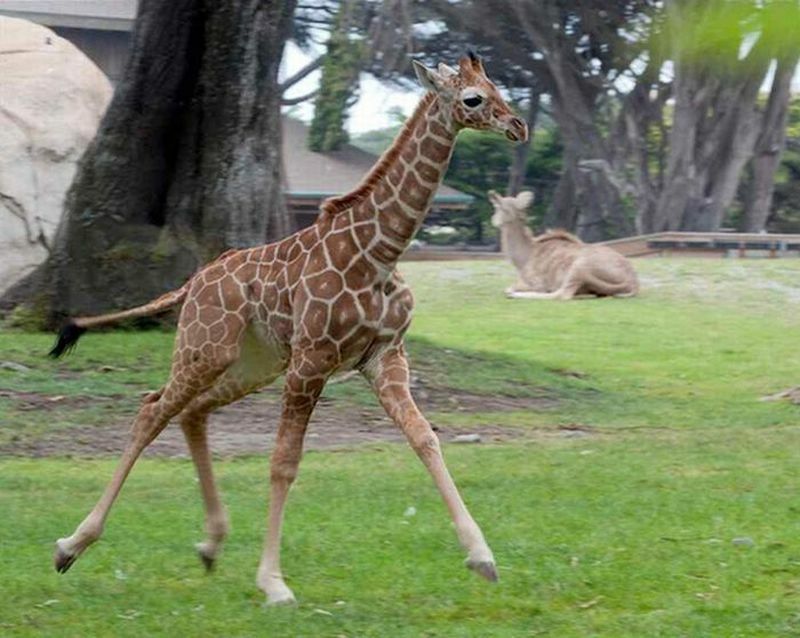 In addition to supporting movement, more specifically its two gaits walking and galloping, the legs of this long-necked African herbivore also serve as a defense mechanism against hyenas and lions, the latter being the only predators in the African savanna which could knock down an adult giraffe. When galloping, typically in order to escape predators, a giraffe can reach a top speed of 37 miles per hour. However, because of its imposing stature, the giraffe tires easily and it cannot sustain a chase over a distance of more than a couple of miles. At lower speeds, due to the impressive length of its legs, the giraffe has a gait similar to pacing, its left legs moving at the same time and then followed by its right legs moving together. The giraffe usually walks at roughly 10 miles per hour. At higher speeds, on the other hand, the giraffe's hind legs cross outside its forelegs, although no two hooves touch the soil at the same time. A baby giraffe is able to run in as little as one hour after birth, although only over a short distance. The lion, which is the giraffe’s main predator, can run as fast as 50 miles per hour, but the giraffe has exceptional eyesight in addition to its remarkable height which helps it spot the lion as far as a half mile away. This increases its chances of escaping the lion. Hyenas generally have the same speed as giraffes (reaching roughly 35 miles per hour), but because they hunt in packs and can take turns when a member of the pack is getting tired, they are extremely dangerous to the giraffe and other animals.